The Lanark and District Museum was formed in 1965 by a group of volunteers called ‘The New Horizons Society’. In 1975 the Village of Lanark municipal council granted the society permission to build a museum. The museum officially opened July 16, 1977. 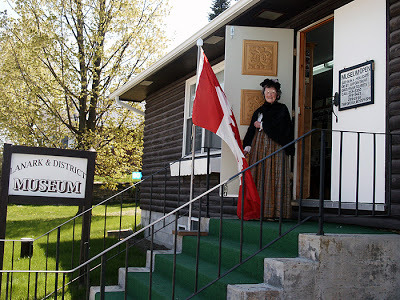 Because the Innisville & District Museum in Drummond Township closed in 2007,the Lanark & District Museum agreed to take on the Innisville Museum Collection in order to preserve that district’s heritage. Today, the museum maintains a growing collection of resources for historical and genealogical research and is staffed by volunteers familiar with area families and artifacts. 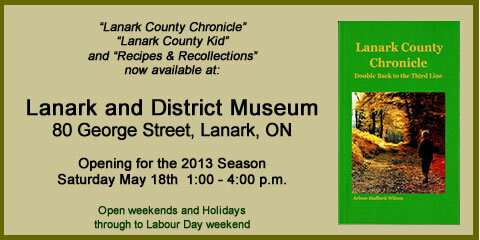 The museum houses many local history books, LACAC Architectural Records for Lanark Village, Canadiana history books, the entire collection of Lanark Era newspapers (1895 – Present), Charles Mair Collection, the works of R. J. Stead, Business Ledgers, Minute Books, School Records and much more. There is also an extensive Genealogical Reference Library which includes families from our coverage area. The museum also carries a selection of publications by local authors and is pleased to add three books by Arlene Stafford-Wilson whose pioneer ancestors settled in Drummond Township in 1818. “Recipes and Recollections: Treats and Tales from Our Mother’s Kitchen” is a collection of prize-winning recipes from Stafford-Wilson’s late Mother who was a local county fair judge. Also included in the book are stories of growing up on the farm in Bathurst Township in post-war days. “Lanark County Kid”, her second book, features local stories set in Lanark, Fallbrook, Balderson, Perth, Almonte and Carleton Place. Her latest release “Lanark County Chronicle” features local stories set in Port Elmsley, Smiths Falls, Perth, Almonte, and many more towns and villages in Lanark County. The museum will open Victoria Day weekend May 18th from 1 – 4pm and will be open Saturdays, Sundays and Holidays through to Labour Day weekend. ADDRESS:	Street address is 80 George St., Lanark Village. This entry was posted in Author Events & Book Signings and tagged Arlene Stafford-Wilson, Lanark and District Museum, Lanark County Museums, Lanark Highlands Museum, Lanark Museum.